As part of my summer recharge, I have a long list of teaching books to re-inspire me in preparation for the next school year. The first book I was excited to read was “The Cage-Busting Teacher” by Rick Hess. I believe strongly that the best way to create better schools is to empower teachers as professionals who can lead them. That said, this is not the kind of change that comes over night and radically disrupts the education system the U.S. designed over a century ago. In other words, it’s difficult for individual teachers to fight all of the policies, people, and procedures–the “cage”–that hinder elevating learning to the next level. 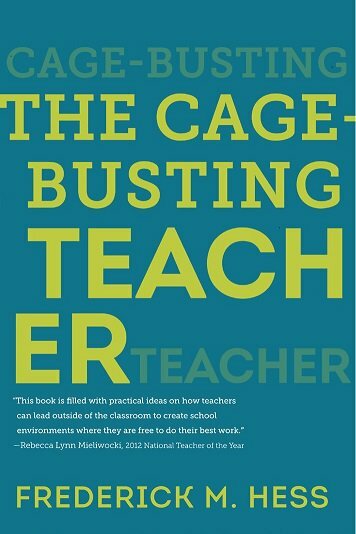 Instead, as Hess lays out in his book, it’s the job of cage-busting teachers to take charge and empower themselves despite these confines. So I wanted to highlight some of my favorite cage-busting strategies. Some I have used successfully and some I intend on using as I look toward the next school year. This is the basic facet that sets cage-busters apart from the rest. You will fight resistance and it will be exhausting and sometimes just plain annoying. Yet, when there is a problem that no one else will take on and administrators aren’t supporting your solution, that doesn’t mean give up. Instead, cage-busters learn to do what they believe is right in order to improve student learning. So, always be the leader willing to take on a problem that others might ignore. This is another big one. As a new(ish) teacher, I feel that the U.S. does a big disservice to its incoming teachers by not educating them about school policy and how to become classroom leaders. Teachers should have to learn about unions, bargaining, contracts, and some of the politics that are notorious for turning teachers away from the profession. I know it’s not glamorous or riveting study material, but, as Hess points out in his book, far too many teachers believe their leaders when they say that something is against policy without asking for proof. In most cases, a leader doesn’t have valid evidence for his decision and it means that there are ways around the supposed roadblocks. Teachers must know the game in order to be on the same playing field as the higher-ups and union reps. As Hess puts it: teachers can’t bust through the cage unless they know where the bars are. Once you have a passion and direction, it’s your job to spread culture at your school. After all, there is power in numbers and it’s the job of cage-busters to show others why their problem matters. It’s never a good idea to just complain about a problem to an administrator or colleague without offering a solution. In fact, a cage-buster usually must implement solutions first in order to get others on board with their ideas. Do this successfully once and it’s almost a guarantee you’ll gain trust and respect from those around you, which will making solving future problems easier. I found this out the hard way already in my career. Being a cage-buster means you feel isolated and like you’re working really hard without much recognition. Unfortunately, that’s part of the job but the good news is you’re not alone. It’s important to find other teachers out there who have the same zeal for bettering themselves and the school at large. My personal sources of inspiration are Edcamps, Twitter chats, and informal meetings with cage-busters at my school. Seek out your own outlets and above all else remember: it’s okay to take a break from cage-busting in order to take care of yourself. Rick Hess’s book is a great read for all teachers who want to learn about outsmarting the frustrations and limits of the teaching profession. I encourage teachers to read it. Overall, I gained a lot of practical advice and I can’t wait to utilize it next year as I continue the battle to improve school-wide learning as a classroom teacher.